In the mid-1990s, the .45 ACP Glock 21 appeared, but I wasn't satisfied. Because it was patterned around a large-capacity magazine, it ended up being a rather large handgun and thus less concealable and user-friendly than what I wanted. 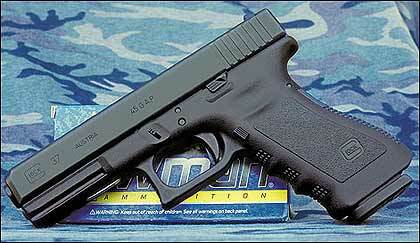 Then, a few years later, the compact Glock 30 .45 ACP appeared. 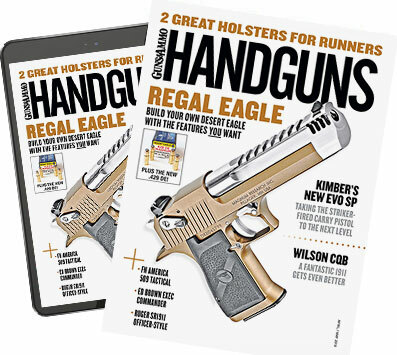 As a compact, it was easier for shooters with average or smaller hands to handle, but, like the Glock 21 from which it came, it was a bit thick in the grip frame for my tastes. As for the Glock 37 itself, it differs from the Glock 17 or 22 only in its slide, which is several ounces heavier, slightly wider (1.125 inches as opposed to 1.010) and a bit higher (.890 inch in comparison to .850). The pistol's overall length is the same as the Glock 17 or 22, but it is five inches high as opposed to the 17's height of 4.96 inches. The leading edge of the triggerguard and the front- and backstraps are, of course, 10-lpi-checkered, as are all Glocks of recent production.